Letters from Guyana | My name is Gabriella Miyares, and I was a Peace Corps Volunteer from 2015-2017. The contents of this website are mine personally and do not reflect any position of the US government or the Peace Corps. My name is Gabriella Miyares, and I was a Peace Corps Volunteer from 2015-2017. The contents of this website are mine personally and do not reflect any position of the US government or the Peace Corps. Some of the 500+ children at my school. Every single one knew my name. I spent six years living in a city of 8 million people. In this city, you had everything. Saw all shapes, sizes, and colors of people. Heard any number of languages spoken on the street. Smelled food from all over the world. In this city, there was little space for privacy, but plenty for anonymity. You could weep on the subway train without shame, knowing chances were you’d never see any of those people again. You could let curses fly at the man who harassed you, secure in the knowledge your language would never get back to your mother. You could impulsively kiss a young man on the dance floor, and the only impact it would have the next day would be in your respective memories. I spent the past two years living in a village of just a few thousand. In this village, I was The Other. Because of the color of my skin, a few shades lighter than anyone else’s. Because of my strange accent, so much less musical and expressive than the local Creolese. Because of my American passport. Because I was unmarried and childless at 28, and when I first arrived, the only young woman in the village with short hair. Any of these would have set me apart. In combination, they ensured I would never be completely able to blend in. It was not the first time I’ve been a visible minority, but it was the first time I’d been one for such an extended period (and it gave me newfound respect for people who are “The Other” for their entire lives). In New York City, I was a small woman with a mostly-shaved head and I was instantly forgettable. I used to go to concerts, dance parties, dinners alone and no one batted an eye. Craving privacy, I used to take refuge in the mixed crowds of humanity, of the constantly changing population of the place. Even before I landed in Guyana, I suspected that would have to change, but I don’t think I fully anticipated the degree to which it would. I went from anonymous bystander to local celebrity in a matter of days, and it was more than a little strange. To be honest, I hated it. I felt eyes on me all of the time, had to carefully consider every word that dropped from my mouth lest it be heard and reported. I learned that “Miss”, the local shorthand for a female teacher, was a term of respect, but also a subtle warning: you are expected to earn that respect 24/7. I learned that in Guyana, people will frankly comment on your physical appearance as a matter of course, and for me, that was a constant reminder of my paleness, the strangeness of my straight brown hair, my lack of makeup, my choice of dress. To integrate into my community, I had to hide certain parts of myself, especially at first. The me that would let loose at dance parties never existed in Guyana. Neither did the me that sometimes liked to go out with her hair coiffed into a little mohawk, or the me that liked to drink whiskey neat, or the me that could be a bit brazen. As a Peace Corps Volunteer, I was always myself, just a different version of myself from before. In my village, I will always be Miss Gabi. Miss Gabi never used to wear anything cut higher than her knees, and the one time she wore shorts reaching to mid-thigh, it was talked about for days. Miss Gabi only drank on Saturdays, and even then it was never more than two beers. Miss Gabi always smiled at you while passing and said “Good morning” or “Good afternoon”. Miss Gabi never flirted with men, and never cursed. Miss Gabi almost never went out after dark, and when she did, it was never alone. But over time, I found myself growing to love parts of my newfound celebrity. For one, it meant that I was always protected in my community. I’d often hear sips from strangers on the waterfront, only to hear “Don’ trouble miss!” from another young man from my village. It also meant that I would be greeted by the village children like a famous person every single day, with delighted “Miss GABI!”s and hugs. It gave me power to speak up and speak out, as when a commission visited to assess the state of local education, and the teachers asked me to be their mouthpiece (not only did I not have to worry about losing my job, but by virtue of my Americanness, I was considered an authority on pretty much any intellectual subject). It meant I always had a front-row seat to any local events, and sometimes was asked to serve as a judge (which, if nothing else, makes for a fun story). And I found, too, that acting happy all of the time translated into a lot of actual happiness. I would say hello and smile and most of the time I’d get a beautiful smile in return. Over the last week, as I said goodbye to my community, I was never more thankful for the speed of village gossip and my lack of anonymity. It meant that every day was a gift; as people heard that I was leaving, they began emerging from the woodwork to thank me and tell me what I had meant to them. A parent of a child at the school stopped me in the road. “Some of the other foreign visitors would go drinking and partying,” he said, “but not you, Miss. It can’t have been easy, but thank you for being such a good role model for our children.” An ancient-looking woman at the post office shook my hand and told me her great-granddaughter was one of the children whose reading improved as a result of my lessons. I was the guest of honor at several assemblies, dinners, and lunches. Bathed in love and appreciation, it was easy to forget the difficulties of otherness. In a few days I will slip back into anonymity, back to my beloved New York City, where the act of not-noticing is almost an art. Part of me is immensely relieved; a burden feels lifted. But along with it, a loss. Walking down the sidewalks, I will always half-expect a little smiling face to pop out of nowhere and say “Miss Gabi!” But those darling faces will be a world away. I will be missing them. My dear friend and fellow Peace Corps Blog It Home winner, Zack, asked me to co-write a blog post about all of the hilariously unexpected similarities between our two distinctive and distant countries of service: Guyana and Samoa. From floor-coverings to time management, dairy products to playground games, bingo to brooms, there’s something to surprise everyone. Go read our creation on his excellent blog, Coconut to the Head. QUIZ: Are You a Well-Integrated Guyana PCV? With less than 30 days left in my service (!!! ), I have finally done what I’ve longed to do for a while… create a Buzzfeed-style quiz about the Peace Corps Guyana experience. Integration — understanding and blending into the local community — is essential to a good service. This quiz will let you know how integrated you are on a scale of Clueless American to Full Guyanese. Head over to “Are You a Well-Integrated Guyana PCV?” at Playbuzz.com… and let me know your results in the comments! As the end of my Peace Corps service draws closer and closer, I have found myself preparing to mourn. Mourn the loss of the lushly brilliant stars, and the electric blue butterflies that float across my path; the perfumed perfection of fresh mangoes, and the peaceful expanse of palm-dotted savannas. But most of all, preparing to mourn my family here, the people of my village; the loss of our proximity and all it has brought. So yes, I was preparing to mourn her. But. Last week she fell ill. She got sick sometimes; she had some digestive issues, and we all figured it was that. But then, suddenly, she was much worse. And, within a few hours, had slipped into a coma. Rushed in a speedboat to the nearest better-equipped hospital, two hours away, she died just a day later. I was not expecting to mourn her this way. Growing up in the incredible privilege the United States affords has given me great faith in doctors and hospitals. I heard she was going out to a better facility and felt relieved, thought, “They will find the problem and they will make it right. She will be home in a few days.” My Guyanese friends and neighbors knew better. They have grown up with a public health system marked by absent equipment, drug shortages, long waits, and crumbling facilities. They knew this might happen, but they tried to do their best for her anyway. And after death, yet another nightmare. Here in Guyana, the family is responsible for buying and applying ice to cool the body – once every 3-4 hours. Here in Guyana, a family member is required to witness the autopsy (not just ID the body). Would you be able to face that, as a parent? I know I wouldn’t. They opted out. In life, without available equipment and expertise, no one ever really knew what was at the root of her disability. And in death, with the postmortem made an unacceptable burden on the family, no one will ever really know what was at the root of her passing. More than ever before, I have felt helpless anger at the state of things here and my inability to change them. More than ever before, I have felt keenly the unfairness of chance: born in the US, and on average you’ll live to 79. Born in Guyana, and on average you’ll live to 66. In the US, we have group homes. 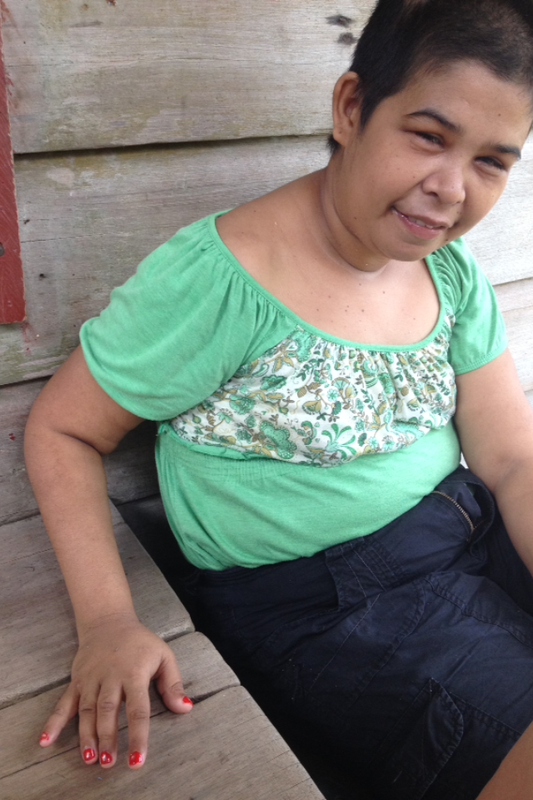 In Guyana, she had her tireless family, especially her mother, who was her nonstop caretaker for over 30 years. But dwelling on all of that won’t bring her back. She was the type of friend who could instinctively tell when you were hurting, and stopped everything to comfort you. She was always there to lift you up. So in the last few days, in whatever moments we can steal, we who loved her have been sharing our favorite memories, lifting ourselves out of the darkness with her help. Once we went swimming at a little boat landing. The day was blazing hot, but she didn’t want to get in the water. After much coaxing, she finally waded in – and for the next couple hours, had us all laughing with her sheer delight. I would go see her sometimes to give her a manicure with some polishes I brought and adorable little nail stickers my friends sent in care packages. She would always spend ages choosing the stickers she wanted, but as for the polish? She chose fire-engine red every time. Good taste. When my friend Annie wrote me a letter telling me she was pregnant, I went to their house to share the news. She looked at me for a second and said “Annie gettin’ a little baby gyirl.” I started to smile but her mother said, “She really predicts these things y’know. You wait and see.” A few months later, Annie had a little baby girl. Weeks ago, we went to visit a friend’s farm, about half an hour drive. After spending the afternoon there and heading back in the night, she was exhausted. The two of us were sitting in the back of the village chief’s pickup. Without saying a word, she moved my bag off of my lap and laid her head down there instead. Within a minute or two, she was fast asleep. After getting some rough news from back home, I came by their house. I didn’t say a word before she jumped out of her chair, strode to the doorway, and threw her arms around me in a long, warm hug. She gave the best hugs in the world. A few days before she died, I went over for my daily gaff with her mom. We were talking of this and that when we both realized that behind us, something more interesting was happening. She and her little niece were playing school together, the little niece doing a pitch-perfect impression of a Guyanese nursery school teacher. Over the next half-hour, she schooled her aunt in spelling, handwriting, counting (“Wrong! You leff out de FIVE!”), how to pray, and all the words of the national pledge and the national anthem. It was so unbearably sweet and funny – the earnest baby teacher, the striving older pupil – that her mother and I sat shaking with silent laughter for a good while. The last time I spoke to her was on the phone. She was about to be discharged from her first hospital visit – the second, final one was still not expected by anyone. But she was uncomfortable and wanted to go home right away, so at her mom’s request I spoke to her to calm her down a little. “Good. I love you,” I said. I never expected to mourn her this way. And yes, I feel anger and yes, I feel a deep sadness. But I also feel so much gratitude. Because to know her, to love her, to be loved by her, was such an incredible gift. It’s something I will cherish for the rest of my life. “I gon miss yuh so bad when yuh go,” she said. We all prepare to mourn, even angels. 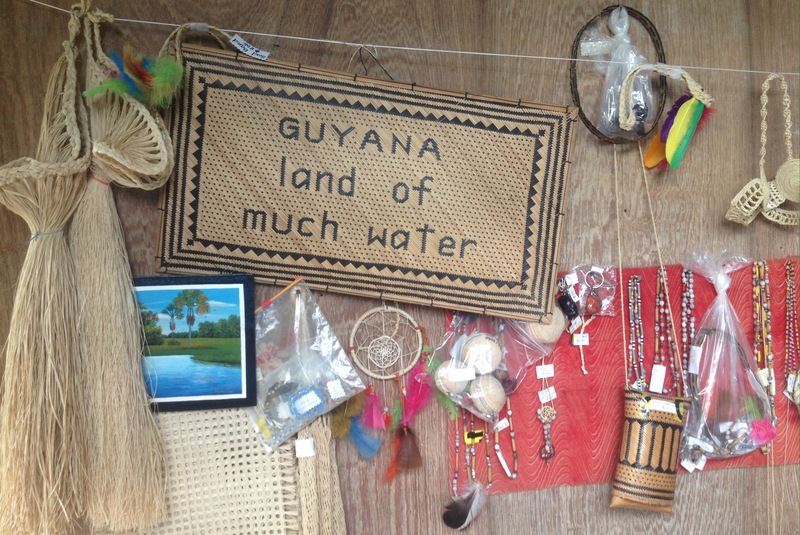 An array of local crafts showcases one of Guyana’s call names: The Land of Many Waters. But water isn’t always plentiful. In Guyana, just as in the U.S., small talk often centers around the weather. In the U.S., this talk often feels safe – everyone experiences weather, but no one gets too fired up about it. But here in Guyana, the weather influences our day to day lives far more than it ever did back home. Talk of climate change becomes a lot more pertinent when you are so dependent on the rain and sun. Farmers, no matter where they are in the world, are attuned to the weather – Guyana is no different. But, with most farming out here meaning small hand-tended local plots, there is no real recourse in cases of flooding or drought. Irrigation and drainage systems are what they were hundreds of years ago: ditches and pails. Big farms in developed countries can afford interventions like importing water, pumping out floods, seeding clouds. Guyana cannot. So when things go bad, the food supply goes bad too. One reason cassava is a staple crop in my village? It happily grows in bad soil, and tolerates changes in weather well. Turn on the news during the American winters and no doubt you’ll see evidence of how snowstorms have shut down one place or another – halting vehicles in their tracks, closing airports. In Guyana, rain has the power to shut things down too – whether it’s from too much, or too little. When the water is too low for boats to come into the village, expect shortages of food, goods, gas. When the water is so high that the roads flood and become pits of mud, expect the same, if not worse. Georgetown, the capital, was built below sea level – and regular floods mean breakdowns in businesses and government offices. At my village school, our “catchment area” (or zoned district) is rather large. Children travel to school daily by bus, canoe, speedboat, and on foot (sometimes walking several miles each way). When it rains heavily, school attendance drops dramatically – and this is due to both the difficulties of getting to school, and also the uptick in sickness that comes with flooding. (You see, bad things can happen when latrines and sprayed farmland flood and contaminate the larger water supply.) When it’s blazingly hot, children come to school, but with headaches, faintness, and nausea: symptoms of dehydration and heat exhaustion. Teachers, too, struggle to keep focus in stiflingly hot classrooms, with no power for A/C units or fans. Subsidized solar power has made big changes in Guyana: most everyone I know has some kind of solar unit, and many (including myself) use it as their only source of electricity. Solar runs the water pump at the school, and used to run the hospital. This is all wonderful until the rainy season hits, and we get overcast skies for weeks at a time. Depending on whether we see the sun or not, we have to ration our electricity carefully, because there is no backup – or if there is, it’s a generator that runs on pricey gasoline. Also, endless rain and drizzle leaves you with no way to dry out laundry. The trash piles are too damp to burn. Everything and everyone begins to smell sour. Here’s what astonished me when I visited the U.S. last year: how absolutely magical running water is. When we need water, we have it pretty much without fail – and it emerges drinkable and hot or cold, depending on our preference. In my village, running water is a rarity, and I am lucky to have it – in two sinks, my toilet, and my bath area. When it comes, it’s not from some kind of reservoir getting pumped through pipes, but from gravity-fed rain tanks. It’s not potable, and it’s always cold (or lukewarm, on sunny days), but at least it’s there. 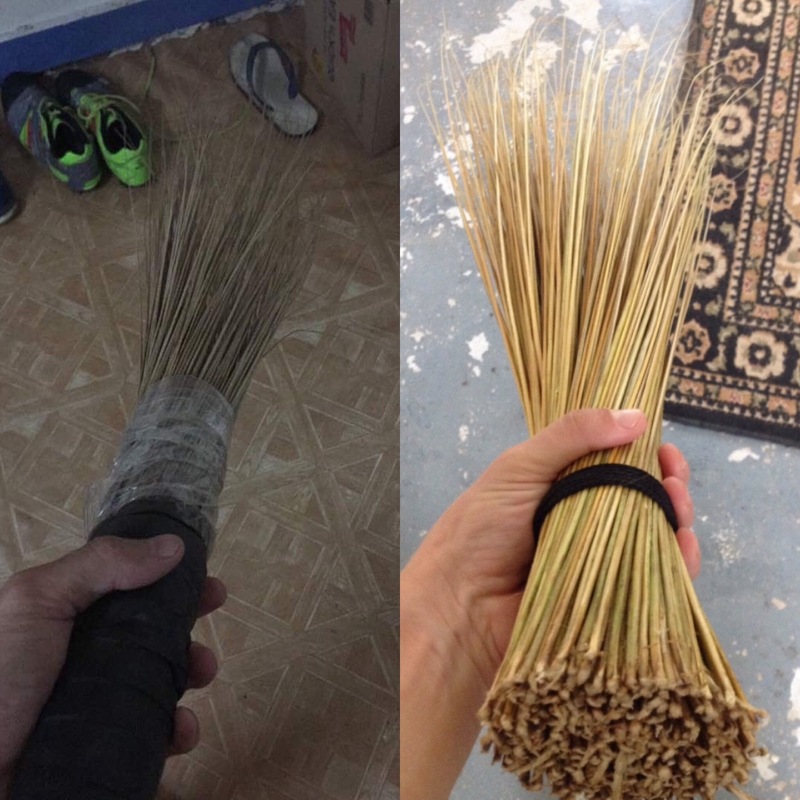 Well, until the dry season hits. Over the past week I have watched as both sinks slowed to a trickle, and finally stopped flowing. Last night I tried to flush my toilet only to find the back tank empty. I’m down to one working faucet and a system of bowls and buckets to wash dishes, fill my water filter, and clear out the toilet. Once that faucet stops, I’ll try going downstairs to a spigot low enough that gravity still should work. I’ll fill five-gallon buckets and carry them up the stairs. Even with all that, I am more fortunate than most. Many of my friends and neighbors have to support large families on the water supply that I have as a single person – so they run out regularly. Many buy bottles of water for drinking and get the rest, after their rain tanks finish, from backyard ponds or nearby creeks and rivers. Fetching water is a chore most Guyanese children take part in from a young age. Second nature to them, unprecedented to me. Living in Guyana has made me think about weather and the environment in a very different way. In most developed countries, we are somewhat isolated from its effects. We have air conditioning and heating: climate controls that help us forget the climate outside. We have infrastructure that can handle baking sun as well as heavy rains. We have electricity sources, and backup electricity sources. We have systems that deliver clean water to our doorsteps and beyond. We take so much for granted. Meanwhile, I have cried tears of joy when it rained because it means I will have enough water. It has become second nature for me to turn off anything I’m not using, to really think about how I can bathe with less water, use just a few sips to brush my teeth, only flush when necessary, and reuse when I can (laundry rinsewater to mop floors, for example). You may not be living in a place where the realities of our water and power consumption are so apparent, but that doesn’t mean a little awareness can’t go a long way. The elusive and mysterious Muon (pronounced MEW-on). My softest companion. 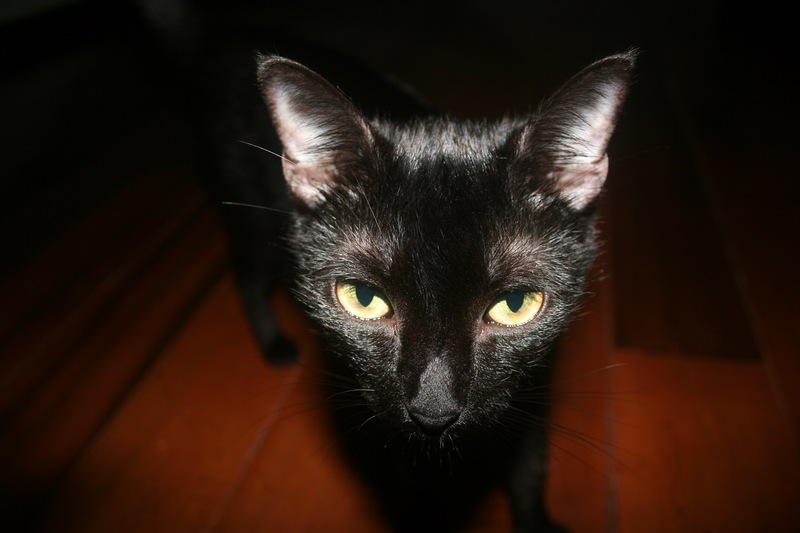 My little black panther. My free pest control. My favorite particle. I cannot imagine my time in Guyana without you. And before you give me that green-eyed stare – you know the one I’m talking about – remember that you were the one that chased me. You were barely old enough to toddle, but bounded speed speed behind me whenever I passed you in the yard. A tiny ball of black fluff that I couldn’t help but take in. I’ve never known a love like this, Muon, though that might be because you are my first pet. (Please, don’t let that tarnish what we have in any way.) No, I don’t count Fitzwilliam Darcy the goldfish. He couldn’t cuddle. You, on the other hand, enjoy curling up at my feet on the nights when the breeze blows in cool, off of the marshy savannah. And when it’s still and sweltering, I wake to you purring above me, nestled in my mosquito net like it’s your own personal hammock. You wait for me at the door when I return from school, and no matter what kind of day I’ve had, it improves as you twine around my legs, imploringly slide your face against my shins. You’re always there for me when the creatures come calling, Muon, which you and I both know is all the time. You so gleefully pounce on giant flying roaches, so enthusiastically crunch away at enormous moths, that I forgive you the times you have chased them into my bed while I was asleep. I know you just wanted me to have a piece of the fun, and I love you for it – despite the memories of tiny legs crawling across my cheek. Feline companion of mine, I thank you for your patience. I have kept you indoors, unlike almost every other cat in Guyana. I have asked you to relieve yourself in a bowl of dry rice, and you oblige. You have listened to the lady-cat outside that yowls at you in her times of, uh, need. You are stoic and unmoving. And when you are moving – out the door, too quickly for me – it is just to leap through the tall grass, to chew at some leaves. I scoop you up and we go back in. You tolerate car rides, boat rides, bus rides with dignity and aplomb. The vet’s injections, not so much, but we all have our limits. I hope you know this was out of love, Muon – to keep you from the battle-scarred future of strays here. Your mother disappeared and so did her older children, your brothers and sisters. I found one in the back, the center of a circle of carrion crows. One in the ditch, rigorously stiff. Who knows of the others? A speeding vehicle, a hungry dog, a vicious catfight, an unshakeable infestation? Pets here, they punish. Ribs visible, limps evident, ears chewed. Not you, Muon. Never you. I love you, Amerindian cyat. I love it when you close your mouth too soon and seem not to notice a bit of pink tongue sticking out, for minutes on end. I love it when you gallop around my apartment in the mornings as I sweep the floor, pinballing yourself around the corner walls like a parkour master. I love it when I find you napping in my bed, splayed on your back, limbs in every direction. I love it when you decide my eyebrows need grooming and get to work on them just after I’ve woken up. Most of all, I love that in you, I have found a more comforting, entertaining, and loving presence than I expected or deserved. On days when all I wanted to do was curl up in bed and have a cry, there you were, meow-chirping at me. On rough boat rides where I felt ready to vomit, you were there in your carrier, reaching out a single paw to place over my hand. When everything seemed hopeless, you came along, running all over the house and jumping a full five feet in the air to catch a giant moth. I couldn’t help but smile. Happy Valentine’s Day, Muon. This may be our last in Guyana, but it’s the first of many more to come. 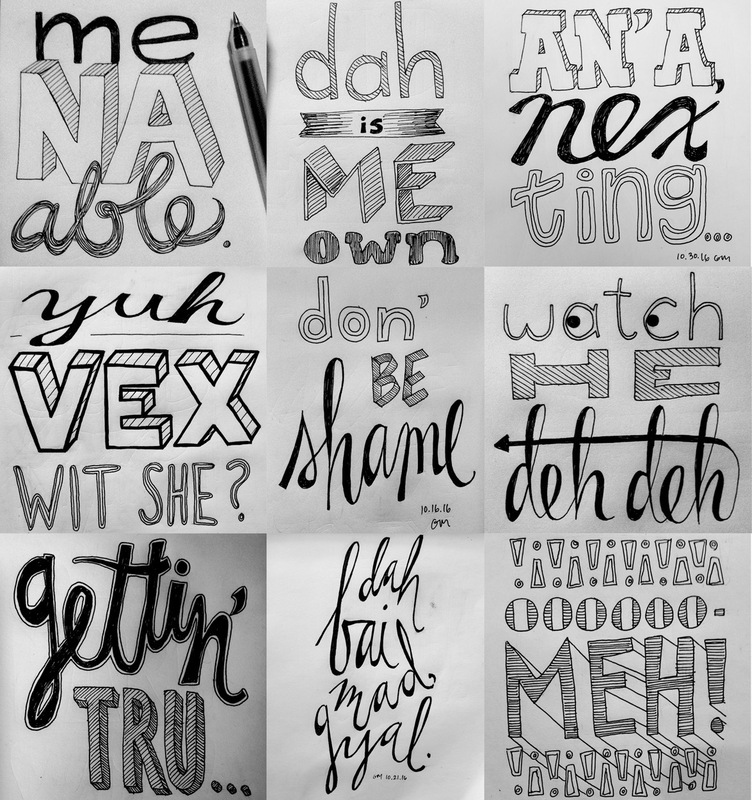 My hand-lettered versions of some favorite Creolese. Nuff nuff work, bai! As you may have gathered from my previous posts, Guyana is an English-speaking country – indeed, the only one in South America. But the English most often heard here isn’t what we, or they, would call “standard.” It’s a linguistic blend, a Creolese, and it delights me daily. When I first arrived, I could understand maybe 50% of what was said. 21 months later, my comprehension is nearly total – that is, until I travel a few hours away and can’t understand anything from a 3-minute minibus conversation except the words “fry fish”. Just as in the U.S., accents vary regionally! I don’t try to speak with an accent, but when I’m with locals I find myself imitating the rhythms and pitch patterns, the musicality. Ending sentences with “…right?” (“I comin’ back, right?”). Repeating words for emphasis (“I was sleepy sleepy!”). And of course, utilizing some of my most-loved Creolese words and phrases. For a little taste of what peppers my speech, here are just a few. My number-one-favorite Guyanese phrase. “Me na able” is the “I can’t even” of Creolese. Often followed by “wi dah” (with that). Endlessly useful. Are you excessively hot? Hungry? Annoyed? Over U.S. politics? You nah able! Ever heard of Caribbean time? It’s a very real phenomenon, and in Guyana, they express it with “jus’ now”. This phrase can mean anything from “in a moment” to “sometime in the next 6 months”. Don’t know when you’ll finish? You’ll finish jus’ now. 3. Dah is me own. 4. Watch he deh deh! “Shame” is used in place of “shy”. Children I see acting like little acrobats in the schoolyard, parkour-ing up palm trees, hide their faces and refuse to answer questions in class. Classic example of bein’ shame. 7. Yuh vex wit she? 8. Dah bai mad, gyal! Jus’ now you gon’ be talkin’ Creolese like a real Guyanese! So don’ be shame front a no one, gaff wi’ dem nuff nuff and if ya see how ya Creolese improve!